One morning I woke up and I sensed the sounds of nature very familiar to my ears. I asked myself, “Where am I? What am I doing?” “Hey Pyone! Good morning.” I heard a woman’s greeting. Sweet and soft. I opened my eyes and I saw Marie Marguerite’s beautiful smile. Oh, then I realized that we were in the woods in Reserve Faunique de Papineau—Labelle, approximately 3 hours drive from Montreal. It turned out that Sergey was the one who enjoyed the canoe trip the most. He was happy to be close to nature, setting the tents, preparing for the quick-quick outdoor breakfasts, lunches and dinners. He enjoyed lying on the sand, dipping into the water in the lake when we stopped over for a short swim. He also seemed very comfortable going to wood for nature calls! Honestly, I was quite surprised when I heard that we would be having a canoe trip and spending two nights in the jungle. People in Burma wouldn’t go into the jungle for vacations; rather they would choose to go to fancy places with a fancy environment. Quite excited to find out what the Canadian adventure was all about. I asked Giovanni whether he would be my canoeing partner and may I say we were the best team in the group. 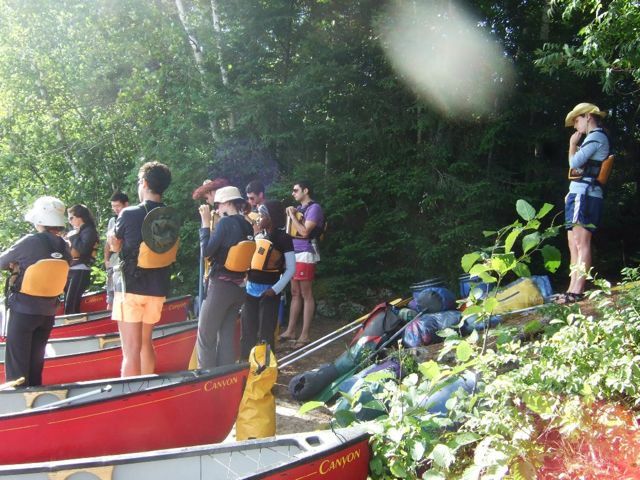 Canoeing was very hard work as I realized when I felt terribly sore after the trip. “Oh! I think the rice is not good after all!” I heard our guide very disappointed in the result of the dinner that he had been making the whole evening; rice with vegetable, half of the rice cooked and half still raw in the same pot. Everyone was tired, hungry and it seemed that we would have to dine very lightly that evening. “Put the burning firewood on the lids to balance the cooking” I easily suggested. He didn’t believe in my advice at first. A few minutes later, all the people started believing that I had saved their dinner. Marshmallows night – strawberry apple and chocolate night – wonderful canoe trip bonding moment for all the Scholars for the rest of the stay in Sauvé House. Jola was very happy dipping in the lake for the very first time in her life. Marta and Ed were strongest at canoeing. Sergey and Tomer turned the canoe 360 degrees several times. Evigeniy helped a lot with the wood and firebuilding. Megan was canoeing partner for Clarice and she was very patient with Clarice. For Liz, canoeing was an easy job.